Create a Christ-focused holiday tradition as you review the sacred names of the Savior. 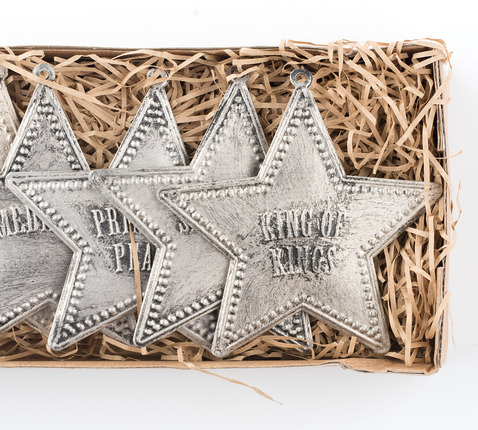 Display these antique pewter-finish ornaments on the tree, as gift tags, or adorning a wreath on the front door. A list of scripture references is included on the box, perfect for a "Twelve Days of Christmas" countdown. 12-piece set. Ornament size: 3¼" x 3¼". *Hooks & twine NOT included. Scripture references are NOT on the ornaments, they are printed on the box. I LOVE these. 5 amazing stars. The stars are beautiful and simple, and the scriptures are listed on the back of the box. These were introduced to me on my mission, my trainer had a small tree, which we put on all 12 of the stars, each one accompanied with a picture of Christ pinned with a clothespin on the tree. We called it our "Christ tree" and it helped us remember the true meaning of Christmas. This is still my favorite tradition, and now I get to buy a set for my husband and I! I purchased nine sets the first year they came out. They were given to my children for their families to place on their trees - one for each night for twelve days. I, too, was disappointed that the scripture verses were not printed on the ornament. I do not know how creative this is, but this is what I did. I threaded ribbon through the hole, so they could be hung. On silver/pewter card stock I typed the reference to the scripture verse in the color of the ribbon and attached it with the ribbon. I think it is important that we surround our families with the true spirit of the season and for us these stars helped bring that spirit into our homes. In fact, I am ordering these for the primary counselors and secretary I work with for this year's Christmas gift. Hope they become available again this year! I bought two boxes of these ornaments last year and ended up giving them to my mother and mother in law. I was so impressed by these that I jumped online to buy myself and some friends some and they were already sold out! They are a perfect gift idea and bring the reason for the season back into the home. I hope they come available again this year as I will definitely buy some more. Love them! First off, these were purchased by a neighbor and given to us as a gift in 2013. I thanked my neighbor, but thought these looked kind of cheap...and the biblical names to me felt disrespectful. Christ didn't seem to be a big fan of people worshiping groves and trees (Old Testament). Still, I put them on my tree in 2013 because of my neighbor. This year, when I pulled them out to put on the tree, I noticed that two of the ornaments had come undone. My wife sowed them together and put them all on our tree. However, several visitors to our home have freely expressed their opinion of them. Terms such as "tacky", "disrespectful", and "sacrilegious" have been used. As such, these ornaments have been taken down and been dropped off at the Sugarhouse Deseret Industries. Would I have ever bought them? No. And I agree that they don't belong on a tree. The stars came and are as beautiful as they appear online and in the magazine. They are good quality and my children are already learning our Savior's names and are asking more questions about Him. What a wonderful way to remember our Lord and Savior in this beautiful season. I just wish they made it clear that the scripture is not on the star itself. 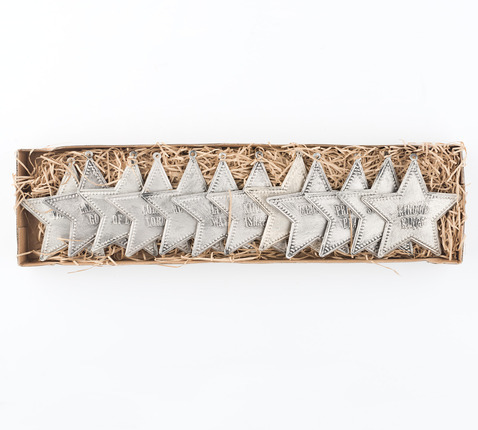 This was the selling point for me, when I read the scripture comes with the name on the star, unfortunately it is only printed on the box, not the star itself. I have to now find a creative way to place the scripture with the star for the people I gift it to. I might buy this again, but would definitely buy it again if they placed the scripture reference on the star as well. *It would be nice if it came with twine or something to hang it with also. These stars are beautiful! I polled my family and we all agree that they add a lot to our tree and we will definitely use them every year. Each of them has a different name for the Savior. Some of them are Bread of Life, Redeemer, Shepherd and Lord of Lords. They are lightweight and will look beautiful on any tree! Anyone who knows me well, knows how much I love Christmas ornaments! I have collected ornaments since I was first married. Many are homemade, several from various places/countries we have visited, and others purchased to remind us of a particular event, memory or other significant meaning. I usually make/buy enough each time for myself and each of our children. Then, when each child leaves home, they take their ornaments with them to begin their own “memory” tree. We have such fun each year getting them all out and traveling down memory lane together. It is one of our happiest traditions! Being tucked away each year, keeps them from becoming commonplace and forgotten. Instead, the memories all come alive each year as we pull them out of the boxes. Such fun! This year, I am excited to add these wonderful BIBLICAL NAMES OF CHRIST Heirloom Ornaments to my Christmas “memory” tree collection. I love the reminder it provides to talk of Christ as we decorate our tree and discuss the various names that have been used to describe Him in the Bible. What a beautiful teaching tool and how perfectly they enrich all of our family memories! These really are awesome ornaments! They’re already on my tree! I love that these ornaments are toddler safe! You don't have to worry about them breaking when a child takes them off of the tree. They also bring the spirit of Christmas into a home. I look for ways to help make Christmas more Christ centered in my home. Having the decorations illustrate the true meaning of the season helps. 12 reasons to be thankful! Gorgeous addition to your Christmas Tree! What better way to reflect on the love you have for Christ than to display all of the names your Heavenly father has become known by through the years on the graces of your trimmed Christmas Tree. A rustic silver color accentuates your tree nicely regardless of your color scheme. I was incredibly excited to order this set and hang them on my tree as a reminder of what Christmas is truly about. 12 reminders of why we are here on earth, and why we celebrate this joyous day. The ornaments are well made and you cannot go wrong, they make wonderful gifts! What a wonderful way to put Christ back in Christmas this year. This set of twelve lovely, antique looking ornaments will provide years of use. Each ornament has a different name of for Christ, and while the scripture verse isn't included on the back of the ornament it is on the back of the box. What a unique idea for starting a new family tradition, by hanging an ornament a day and reading the scripture that goes along with the particular ornament. I plan on starting with Lamb of God, John1:29 and follow the list until I finally arrive at King of Kings,Rev.17:14 on Christmas Eve. The only thing that would have made these ornaments better would have been if the scripture reference would have been on the back of the ornament. 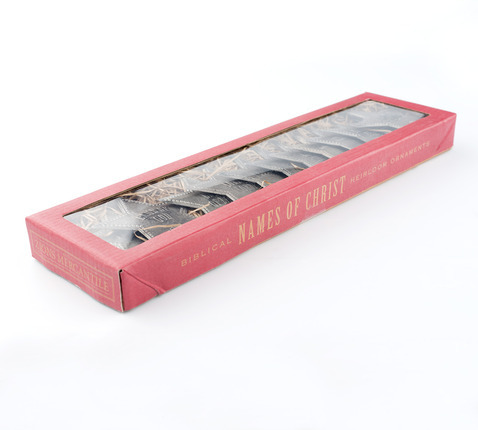 Suitable for gift giving, the Biblical Names of Christ Ornaments come in a sturdy box that displays the ornaments nicely. If you're looking for a unique decoration for your tree, or perhaps you need a gift for someone that might be hard to buy for I suggest checking out these ornaments. Just received these & love them! I got 2 sets & wished I had a dozen more sets. I know I'll want more sets as years go by (for that 'just right' gift) & won't be able to find them again. They are packaged in a Zion's Mercantile box; lid has a window & ornaments are sitting on a bed of shredded craft paper....great presentation. These are little treasures that will infuse my Christmas tree with the true spirit of Christmas. They'll be sprinkled among our family heirloom ornament collection & gain heirloom status, too. Thank you for a great little find! I was excited when I opened the package and saw these ornaments. I wanted to go decorate my little Christmas tree right then. But first I have to go buy some hooks. first they look good. Each star is the same size but each has on it a different name of the Savior. On the back of the box has the name and scripture with that name. I like the idea of bring more of Christ back into Christmas. I think it would be good to read the scripture that goes with each ornament as we hang them on the tree. I have a little tree that these ornaments will go on very soon. It is never too early to Remember the birth of the Savior and all he has done for us. You could put these ornaments on a wreath, put them of Christmas gifts, use it for the twelve days of Christmas or many other uses for those who are creative. They do clang if they bang into each other. You could even make a special wind chime them. Me I am going to put on the tree this week and keep them for me. I was given these ornaments for purpose of reviewing them. I like them. Hi this is a little disappointing as the scripture references are not on the back of the stars and there is no way to hang them on the tree. 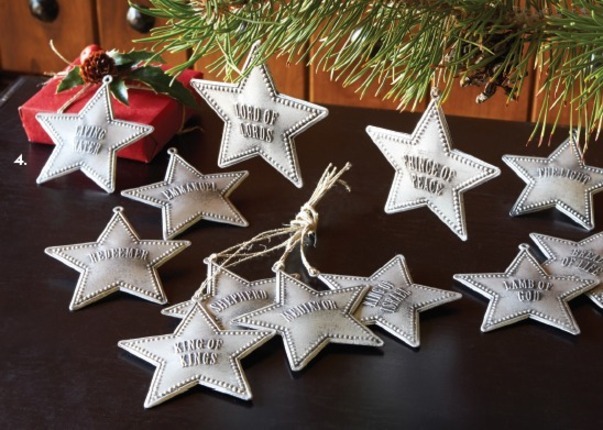 I love the idea of these ornaments, but I really don't like that they look like old west sheriff badges!